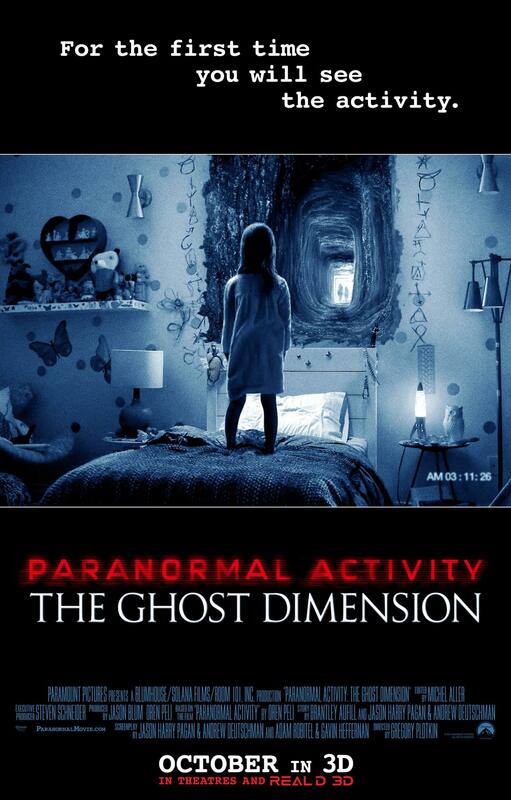 Promoted as the series’ entry that ties everything together and explains all that’s happened in the previous five movies, Paranormal Activity: The Ghost Dimension has arrived at a point where rounding off the convoluted storyline begun (quite simply) back in 2007 has ceased to be of any interest. It’s likely that most people, even fans, gave up after Paranormal Activity 3 (2011), as the producers attempted to make each instalment part of a bigger whole. This led to Katie Featherston’s character popping up in unlikely places to ensure some kind of continuity, and the slow but inevitable decline in both plausibility and scares. 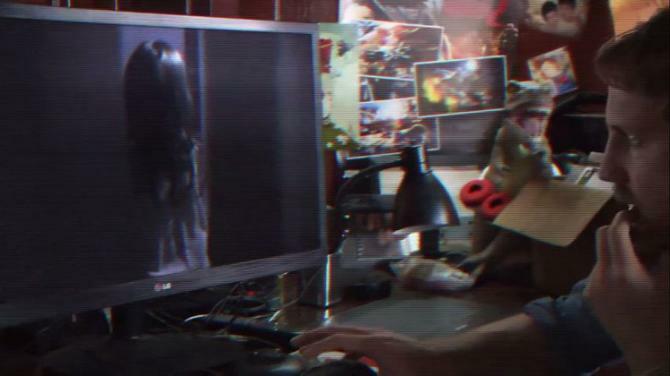 But with this concluding entry, the makers have decided to ignore the events of Paranormal Activity 4 (2012) and Paranormal Activity: The Marked Ones (2014) and bring back the younger versions of Katie (Csengery) and Kristi (Brown) in a game of video charades. With a new couple, Ryan (Murray) and Emily (Shaw), who move in to a new home with their young daughter Leila (George), set up as prospective victims of the entity now known as Toby, the movie adds a semi-live-in nanny, Skyler (Dudley) and Ryan’s visiting brother Mike (Gill) to the mix, and once a box full of old video tapes and a video camera that looks like a parody of a boombox is found, begins to wrap things up very untidily indeed. As Ryan becomes obsessed with going through the tapes, strange things begin to happen in the house – strange, that is, if you haven’t seen the previous five movies (though perhaps the strangest thing is the Xmas tree, which keeps changing in size throughout – now that’s spooky). It soon becomes obvious that Leila is the focus for all this weird activity, and Ryan and Mike set up cameras around the house to film it all. It’s not long before we see a strange black figure coalescing in Leila’s room at night, or emanating from the upstairs ceiling. It’s aggressive, it’s trying to become fully formed, and it doesn’t register on every camera (this is meant to be unnerving, but serves only to make us watch even more static shots where nothing is happening). And amongst a whole slew of “explanations” for what’s happening, Ryan and Emily discover that the house they’re in has been built over the location of Katie and Micah’s house (from the first movie) that burnt down (which again is meant to be unnerving, but just seems like one “coincidence” too far). Thanks to the familiarity and the structures of the previous movies, this (hopefully) final movie soon finds itself painted into a corner. Toby makes more progress toward human form in this movie than in all the others combined, which makes you wonder why it’s taken him this long. The scares still consist of things rushing at or past one of the cameras, and the slow build of tension that made the first movie so effective, has now become so devalued that instead of feeling anxious, the viewer is more likely to feel bored. And the characters still insist on carrying cameras around with them when the ectoplasm hits the fan, a problem none of the movies has been able to address with any confidence. If this is to be the last in the franchise – and there’s no reason it should be, given the final outcome – then it will qualify as the least in the series thanks to the tired nature of the narrative, and an unwillingness to do anything that might be innovative or surprising. And as if to confirm – if confirmation were needed – just how devoid of originality the movie is, the Ghost Dimension, so hyped up before the movie’s release, proves to be just… another… room. Rating: 3/10 – unable even to sign off satisfactorily, Paranormal Activity: The Ghost Dimension sees the series grind to a creative halt amid a welter of dull scenes that rarely relate to each other let alone the rest of the franchise; with such a disregard for its own legacy, the series deserves to be laid to rest now, but if a seventh movie is on the cards, then it needs to ignore everything that’s gone before and come up with a brand new story entirely – because this one is broken beyond all repair. 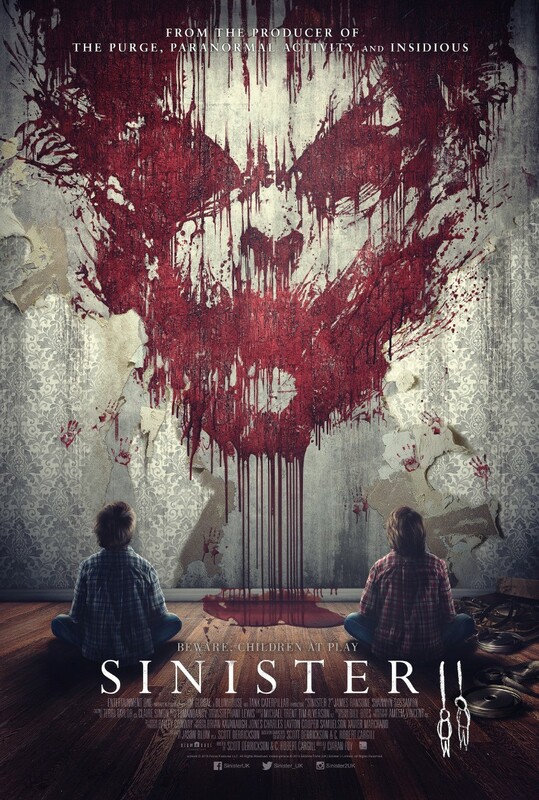 The original Sinister (2012) was a surprise, both in its inventive storyline and writer/director Scott Derrickson’s confidence with the material. Its principal villain, the demon Bughuul (King) – looking like a badly scarred Nick Cave – was kept largely in the shadows and his motives went largely unrevealed. It was a mostly effective mix of horror movie and mystery drama, and was bolstered by Ethan Hawke’s committed performance. But as with any horror movie that achieves even limited success at the box office, the inevitable sequel is here at last. With Hawke’s character no longer around for the viewer to follow up with, we’re left with Ransone’s secondary, unnamed character as our guide to what follows. As the now ex-deputy (called So-and-So in the credits), he’s begun following the trail of killings related to Bughuul and is travelling around the US burning the buildings that these killings have taken place in, the idea being that Bughuul’s legacy can’t be continued in the same place by future inhabitants. At one such place he encounters Courtney (Sossamon), a mother with two sons, Dylan (R. Sloan) and Zach (D. Sloan), who is hiding from her abusive husband (Coco) pending a custody battle. Of course, the ex-deputy is already too late. Dylan is spending most nights in the basement watching snuff movies with the likes of Bughuul protégé Milo (Zumann) and his equally dead friends. Once Dylan has watched all the movies they have to offer, then he can make his own and become the latest in the long line of Bughuul’s victims. The movie cheats a bit at the start by showing us a snuff movie that we’ll see the making of later on (and which turns out differently), and it delves perhaps too deeply into the origins of its villain, making him into a kind of globetrotting malevolent entity who can pop up anywhere, and in any culture. Thanks to the same judicious use of his appearance in the movie as the first one though, Bughuul remains as scary in appearance as he did before, but with the sense of threat firmly linked to Milo and the other children, his occasional appearances lack the intensity of the first movie. The central plot – Dylan’s recruitment by Milo – is enhanced by the snuff movies he’s encouraged to watch. These are the movie’s grim highlights, their 16mm nature proving as effective as they did in part one. One, Fishing Trip, is perhaps the nastiest (and well made), though Sunday Service gives it a run for its money. But when the movie stops for us to see one of them, it serves also as a reminder that this is where the movie really works, not with its soap opera style romance between the ex-deputy and Courtney, nor the domestic violence dramatics once Courtney and the kids are back with daddy. These are necessary to pad out the running time and give us some breathing space between the moments of horror, but are equally those moments you wish the movie would get through more quickly. The performances are average, with Ransone’s shy, reclusive nature soon becoming annoying, and Sossamon finally eschewing the ragged fringe look we’ve seen way too often. The brothers Sloan are okay, with Dartanian looking at times like a younger Ryan Lee, but Zumann gives such a mannered and off-putting portrayal as Milo that you wish he had less screen time (this is definitely not one of those movies where the children give easily the best performances). In the end, Sinister 2 has a hard time justifying its existence beyond being an opportunistic cash-in on the back of an unexpected success (though some horror movie sequels have been made for even less exalted reasons). It doesn’t further the original story in any meaningful way, and has less to say about the nature of evil, something the original did with some degree of interest and flair. There are no prizes for guessing the outcome, nor that the last scene will feature a groan-inducing “scare”, and equally there’s very little chance that this will be a movie you’ll want to come back to, even if someone asks you to. Rating: 5/10 – horror sequels such as Sinister 2 exist in a parallel world of movie making where it’s assumed that people want more of something that’s been successful, but really, that’s rarely the case; a largely by-the-numbers approach that will remind many viewers of horror sequels from the Nineties, this is a movie that never tries to be anything but a movie trying to be successful off the back of its predecessor.